Hi there, my name's Sarah Beach and I'm the founder of STRONG. The Magazine for Girls. I decided I wanted to create a magazine for middle school girls when I spoke to my own daughters, Lucy (12) and Daisy (10) about their futures. Despite being intelligent, energetic and capable young women, it transpired that they already had set ideas on what their future could be. They already thought there were some things they couldn't really do because they are female. They had absorbed the message that society had been sending them their whole lives that women tend to behave in a certain way, do certain jobs and like certain things. Who can blame them? They are surrounded by books with male protagonists, and magazines about fashion, celebrities and body image. In the news they see how hard women are still having to fight for equality, and they are surrounded by male role models. There are more male astronauts, more male politicians, more men running companies. In school their teachers are still predominately female, and the doctors and surgeons they visit are still predominately male. Right now, both girls are doing well in school in all subjects. Lucy's favorite subject is Math, and she's good at it. They both enjoy cheerleading (there are no male cheerleaders in our town and only one female that I'm aware of who plays football), as well as acting and singing. But they also love rowing on the pond and getting out of the boat into the mud and getting filthy. They like building dens in the woods. Daisy loves to play drums. They both love animals (we have quite a zoo at our house!) Daisy loves to play soccer and Lucy loves to build - anything and everything. The middle school years are tough. Girls and boys are busy trying to fit in, and trying to figure out who they are. When I looked at the world through my kids' eyes I saw just how many messages they were getting that pushed them towards a narrowing path. I know many, many girls, and many boys too, love reading about celebrities and fashion, and that's great. But the more I thought about it, the more I thought that my girls, and all our daughters, deserve something else. They deserve to see strong female role models in all walks of life, so they can see that there are women out there who are taking their place in the world alongside men, running businesses and countries, and making the world a better place. They need to see examples of people like them, who have refused to be put in a box by society and who are following their dreams and succeeding. Things have been improving, but still, women account for over 50% of the workforce but only hold 26% of tech industry jobs, and only 11% of executives in Forbes 500 companies are female. We still haven't seen a female President or Vice President, and only 37% of physicians and surgeons are female. In so many areas, females are massively underrepresented, and until our young girls see women succeeding in all areas, they are always going to feel that there are some things that girls just don't do. STRONG aims to break the mold! 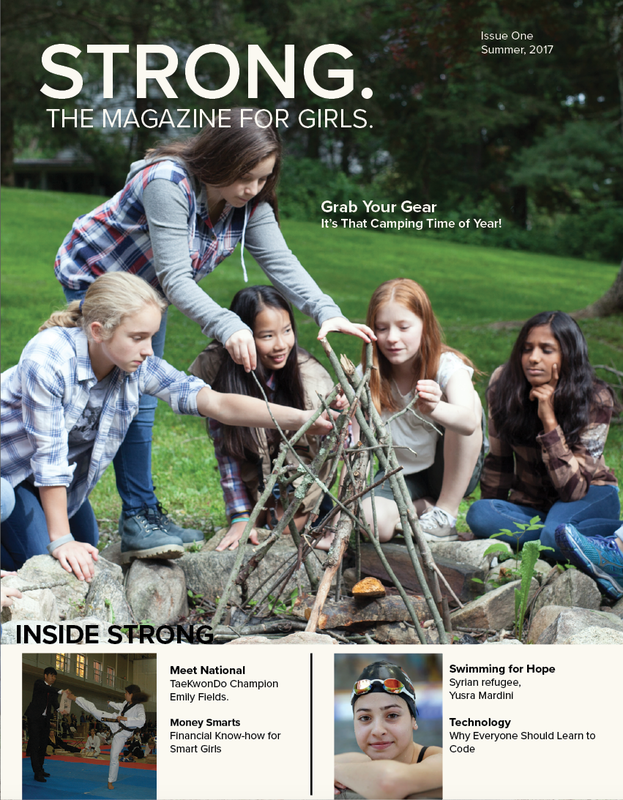 At a time in their lives when girls are trying to decide how they fit in and who they should be, STRONG magazine will provide girls with strong female role models and a balanced, tolerant and diverse view of the world they live in. It will show our youth that girls have passions and interests that extend far beyond the female stereotypes they are so often surrounded by. Initially a quarterly publication, STRONG will feature articles on women who have influenced the world, as well as young girls their age who are making a big difference. Girls from other cultures and countries will also be featured, and readers can learn how to stay healthy in body and mind, with regular columns from our nutritionist and our child psychologist. We would love your support. Please follow our blog for regular updates. We want STRONG to be a magazine that genuinely reflects girls today with their diverse lives and interests. We want girls to be inspired by reading about other girls like them who are pursuing their dreams. We want to help girls realize that there are women out there all over the world breaking glass ceilings and taking their place alongside men. We want to encourage girls to take responsibility for looking after their own bodies and minds. We want to teach girls fundamental life skills that every young adult should learn: from managing their money and their time, to doing their laundry, basic first aid and everything in between. We want to help girls understand the world they are growing up in by talking about current and historical events and by showing them other countries and cultures. We want to promote tolerance and kindness.